The government will back an NDP MP's bill pushing the change. Prime Minister Justin Trudeau speaks on behalf of the government as the final report of the Truth and Reconciliation commission is released on Dec. 15, 2015 in Ottawa. OTTAWA — The federal government says it will back an NDP private member's bill calling for the establishment of a new statutory holiday to be known as National Indigenous Peoples Day. "The prime minister has said it many times: there is no relationship more important to Canada than the one with Indigenous peoples," Simon Ross, Heritage Minister Pablo Rodriguez' press secretary, told HuffPost Canada Wednesday. 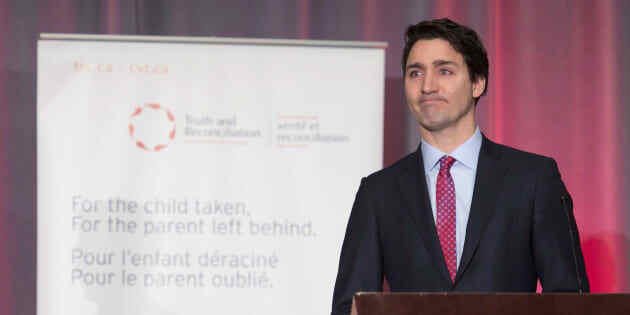 Prior to the 2015 election, Justin Trudeau had pledged to fully implement the TRC recommendations. He later reaffirmed that commitment when the commission released its 94 calls to action. "Call to Action 80 asks the Government of Canada to establish a National Day for Truth and Reconciliation to honour the survivors of residential schools. That's exactly what we will do, and we will do that in partnership with Indigenous peoples," Ross said. The federal government has begun reaching out to Indigenous leaders but hasn't started formal negotiations. In a statement Wednesday, Assembly of First Nations' National Chief Perry Bellegarde called the residential schools era a dark chapter that Canadians must never forget. "A day dedicated to remembering and honouring the students of residential schools will help to increase public understanding of our shared history, and better inform our work together going forward," he said. "It is an important part of reconciliation and First Nations need to be involved in choosing an appropriate date." Sept. 30 is when many Indigenous children were separated from their families and sent to residential schools. In 2013, Phyllis Webstad started the Orange Shirt Day as a way of marking the harm many survivors were left with. It represents the orange shirt that was stripped off her back when, as a six-year-old, she first set foot at the St. Joseph's Residential School in Williams Lake, B.C. He noted how the Métis' experience was not included in the former prime minister's 2008 apology, the residential school settlement agreement, or the TRC mandate. "We are on the outside looking in," said Chartier, who himself attended the Île-à-la-Crosse residential school in Northern Saskatchewan for 10 years. The Métis are still negotiating with Ottawa and through the courts, he said. "I do believe that it is important for those who have been apologized to, for those who have met with some kind of reconciliation and compensation," he said. Georgina Jolibois, the NDP MP who sponsored the bill, said the Grits' support come as a surprise. "That is news to me," she told HuffPost. She hopes June 21 is designated as a day to honour and recognize the unique culture of First Nations, Inuit and Métis because it's the summer solstice and a day with a lot of meaning for Indigenous people, she said. "One aim of my bill," she told the Commons back in March, "is to bring a sense of hope to Indigenous communities across Canada by creating a day that recognizes their lives, their culture, and their influence." NDP MP Georgina Jolibois is pictured on Parliament Hill in Ottawa on Feb. 25, 2016. Jolibois noted how the National Indian Brotherhood, the precursor to the Assembly of First Nations, attempted in 1982 to have a National Aboriginal Day recognized as a national holiday. Four years later, Governor General Roméo LeBlanc proclaimed June 21 National Aboriginal Day but it lacked the status of a statutory holiday. Wednesday,Inuit Tapiriit Kanatami, the national Inuit organization, was holding its annual general meeting and no one was unavailable to offer comment. The group will announce the results of its election for president Thursday. But the executive director of The Native Women's Association of Canada, Lynne Groulx, told HuffPost she was unaware of any federal government approach. Casey noted that a "paid non-working holiday" would affect approximately six per cent of Canada's workforce or 904,000 employees working for the federal government or for federally-regulated sectors such as banking, aviation, and telecommunications. "It is important to note that in order for us to designate this day as a paid holiday for all Canadians, federal public service collective agreements have to be amended, and the provinces and territories have to amend their respective laws if they have not done so already," he said. Casey ended his speech by calling upon the House to "carefully consider all the implications of the bill before us." Jolibois' private member's bill is up for a second hour of debate in September. It will then be voted on and sent to committee for further study. Indigenous Affairs Critic Cathy McLeod said the Tories believe in "reconciliation with all Indigenous peoples" but federal efforts should focus on poverty reduction and establishing transparent and open government. "We respect and appreciate National Indigenous Peoples Day, but we are not sure that creating a federal statutory holiday is the approach to take," she said. During her speech in the House, Jolibois noted that she had received significant support for her bill but also "racist," "unprofessional," "illogical," and "uncalled for" comments. "Too many Indigenous peoples live with this language on a daily basis, and I firmly believe that taking steps toward reconciliation will alleviate at least some of the pain caused by this language," the First Nations' woman said. On Twitter Wednesday, former Conservative leadership contender Maxime Bernier took some heat for suggesting that a national day to mark reconciliation with Indigenous peoples was an effort at "extreme" political correctness and multiculturalism. "Why not celebrate instead the heritage and renewal of aboriginal cultures? That would unite us in positive way. Cult of victimhood and obsession with past wrongs instead of focus on the progress made and to come are another sick characteristic of extreme PC and multiculturalism," he tweeted. Members of the opposition have called on Conservative Leader Andrew Scheer to boot Bernier from caucus, following a series of his MP's tweets which were widely seen as racist.